I read some time ago about Kinsey purchasing/ obtaining diary from a railroad inspector/ engineer in the 1940's in which that subhuman documented abusing children as he got to work in in the various parts of the US. Unfortunately the name of that monster escaped my mind. You are correct. While I don’t remember his name either, there are multiple documented cases of the sexual abuse of minors in Kinsey’s pseudo-scientific work. Kinsey was also a monster. Ralph Voris? A relative perhaps? I was wondering the exact same thing Tom. 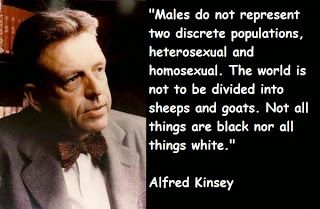 Michael Voris did a special on the sexual Revolution and highlighted Kinsey as a sort of Godfather of perversity. This was years ago when I had first accepted the Sedevacantist opinion. If memory serves me correctly it's worth watching just once. Ironic. Hopefully, Mr Voris gets right with God and joins the One True Church. An interesting combination of a given name and a surname (King King). I wonder if real at all or just made up to further protect that pervert's identity. They rarely get justice in this world but thank God for the Divine Justice. From what I have read recently Francis intends to do away with celibacy and let Priests marry. If this along with Communion for Adulterers doesn't wake people up to the fact that Francis is an imposter and not a true Pope, I don't know what will. The Vatican II sect gets more perverse by the moment. Yes, Joann. And most people still don’t see the wolf in St Peter’s clothing.